CarGurus has 8,400 nationwide Town & Country listings starting at $550. Chrysler revolutionized the auto industry when it introduced the minivan concept in 1983. The 2016 Chrysler Town & Country continues to offer a competent ride, plenty of features, and the traditional family- and car-pool-friendly 3 rows of seating and 7 seats overall. The projected deletion of the Dodge Caravan after the 2016 model year will make the 5-door Town & Country the last van standing in this legendary Detroit-based lineup. So it should not be a surprise that there are rumors of a hefty redesign for the Town & Country in 2017. This classy Chrysler comes in its 6 familiar trims for 2016: the base LX, the up-featured Touring, the sporty S, the safety-minded Touring-L, the high-end Limited, and the flagship Limited Platinum. The Town & Country will also come in a special Anniversary Edition for the upcoming model year. This limited-production Anniversary Edition is based on the Touring-L trim and will reportedly add extra standard features. Otherwise, the Town & Country carries over largely unchanged from the current version, meaning front-wheel drive (FWD) only and a cargo capacity of 143.8 feet with the rear seats folded. All 2016 Town & Country variants are expected to keep their 3.6-liter flex-fuel (ethanol-capable) V6, again mated with a 6-speed shiftable automatic transmission for 283 hp and 260 lb-ft of torque. Estimated fuel economy is expected to return at 17 mpg city/25 highway/20 combined. The entry-level LX trim will again offer standard 17-inch alloy wheels, a roof rack, auxiliary transmission cooling, a power liftgate and dual power-sliding rear passenger doors, while the cabin keeps its leather upholstery, reclining Stow'n'Go second-row folding seats, and full power accessories. Cruise control and telescoping tilt-wheel steering are also slated to return as standard equipment in this base trim, along with a remote garage door opener, a rear-view camera, dual-zone automatic climate control, and an auto-dimming rear-view mirror. Techno-goodies include Bluetooth-interfaced Uconnect infotainment boasting a 6.5-inch touchscreen and a single-CD/MP3 player with 6 speakers, satellite radio, a video monitor, and an auxiliary audio input. Look for heated power-adjustable front seats, tri-zone climate control, and rear-seat DVD entertainment in higher trims. The Anniversary Edition adds a power sunroof, heated second-row seats, a heated steering wheel, and keyless entry and ignition to the Touring-L’s standard rear parking sensors, blind-spot monitor, rear cross-traffic detection, remote engine start, and auto-dimming outside mirrors. The Limited and Limited Platinum Town & Country variations add such standard luxuries as GPS navigation (via Uconnect), upgraded leather upholstery, power-folding outside mirrors, power-adjustable pedals, memory for driver settings, power-folding and -reclining third-row seating, and a 9-speaker premium audio system. The lower trims remain eligible for many of the options that come standard in higher trims, while additional higher-trim options will include load-leveling suspension, a trailer-towing package, upgraded exterior and interior accents, and Mopar step running boards. Standard safety equipment aboard all 2016 Town & Country editions consists of 4-wheel antilock braking (ABS), traction and stability control, front side-mounted airbags, 3-row head protection airbags, daytime running lights, and a post-collision safety system. The Touring and upper trims additionally tote standard front fog/driving lights, while the Touring-L, Anniversary Edition, Limited, and Limited Platinum variations are again scheduled to include automatic high-low-beam headlights. The flagship Limited Platinum is again expected to add high-intensity-discharge headlights to its list of standard safety features. In government safety tests, the current Town & Country variants receive high marks overall, while the insurance industry rates this minivan poorly in small-overlap front collision testing. Owners of the current year’s Town & Country mention uncomfortable seats and flimsy, low-end interior materials as drawbacks to this otherwise well-wrought Chrysler--but its looks, performance, and value continue to garner their fair share of praise. Look for the 2016 Town & Country to appear in dealer showrooms during the last quarter of 2015, where it will again challenge Honda’s enviable Odyssey, Toyota’s slick Sienna, Nissan’s quality-laden Quest, and Kia’s surprisingly spiffy Sedona for minivan sales supremacy. 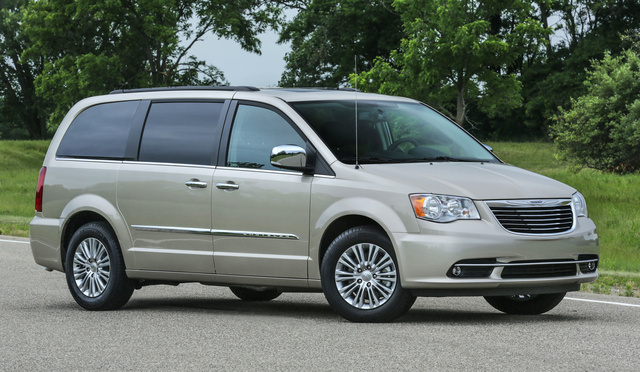 What's your take on the 2016 Chrysler Town & Country? Kenneth I needed to haul two sheets of three quarter inch chip board so I put the seats down and with two helpers I shoved them in. It seemed like a tight fit but they slid in okay. When cutting up the flooring I found they were not four by eight feet at all, they were an inch wider and an inch longer than I expected. Try that with you standard pick up truck. 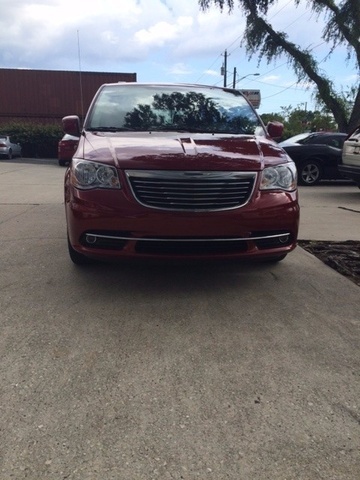 Have you driven a 2016 Chrysler Town & Country? 2016 Town And Country Sliding Door Won't Unlock! I am having a problem viewing my maps. The system keeps saying No Detail Maps available. How can I clear this error so I can use my Nav? 2016 Town And Country Trasmission Is It Sealed? is the automatic trasmission sealed unit? We did what everyone said and got our sliding door to unlock but now every time it locks it buzzes. How do we stop the buzzing?